Cortec CorrVerter is a water-based primer recommended for application to rusty or poorly prepared steel surfaces where further corrosion protection is required and good surface preparation is difficult to achieve. CorrVerter is formulated to penetrate rust, eliminate rust, penetrate to the bare metal, and stop further rusting. 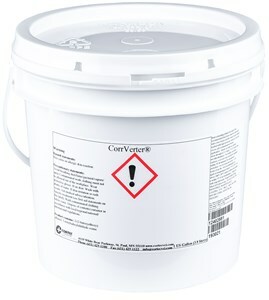 CorrVerter contains a novel chemical chelating agent that modifies the surface rust into a hydrophobic passive layer. CorrVerter combines the above mentioned chelating agent with a high solids waterborne latex with extremely low water vapor permeability. The combination of the active chelating agent with a film-forming latex, thickeners and dispersant offers a unique formulation for a primer with excellent protection against re-rusting. CorrVerter does not contain tannic or phosphoric acids, provides long-term corrosion protection for poorly prepared substrates, and can be topcoated with solvent-based and water-based paints with no bleeding. For outdoor applications VpCI-386 or VpCI-387 can be utilized. For indoor applications, VpCI-396 may also be used. The combination of CorrVerter and VpCI-396 provides the best immersion coating for submersion in water, salt water, hydro carbons and high salinity water. Typical Application: CorrVerter is recommended for use on all ferrous metal surfaces as a rust converter/paint primer. The product can be used in situations where proper cleaning or sandblasting is difficult. Applications: Outdoor storage, aircraft, elevators, storage tanks, vehicles, pumps, cargo holds, marine equipment. Application Instructions: It is recommended that any loose rust be removed with a wire brush and the rusty steel surface washed with high-pressure water to remove excess salt contamination before applying the product. Brush, roll, or spray CorrVerter with no surface show-through at 3-5 mils (75-125 microns) wet film thickness. Brush application is preferred to ensure penetration into the rust. The coating can be applied to dry or damp surfaces. The converter can be used as is or may be diluted up to 10% with water. For badly corroded surfaces, a second coat of CorrVerter should be applied within 20-30 minutes to ensure maximum protection. Allow to air dry 12-24 hours before applying topcoat or putting the coated components into the environment. Please Note: Keep product from freezing. The shelf life of the coating is one year.